This is a very quick, easy and light breakfast idea. 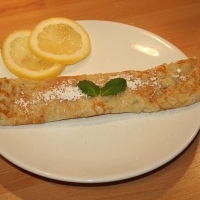 They are very similar to a French crepe, but more eggy. Mix flour and salt well; then add eggs; mix well. Gradually stir in half of the milk then beat with a wooden spoon for 4 to 5 minutes. Stir in remaining milk, beat lightly; allow to stand for 10 minutes then beat again before using. Pour enough batter in the pan in pan to make a very thin layer, swirling the pan to coat; let cook until bubbly then turn. Turn out onto plate, squeeze with lemon juice, sprinkle sugar and role up.